Mo-Mo Paradise sign downstairs of the premises, originally uploaded by Camemberu. After exploring the Ishibashi store at the BEAM Building in Shibuya, I saw that Mo-Mo Paradise was just upstairs! Ah, shabu-shabu - personally something I have never tried, as have found it too close to Chinese steamboat in the past (not a big fan of that either). But perhaps it's different in Japan. 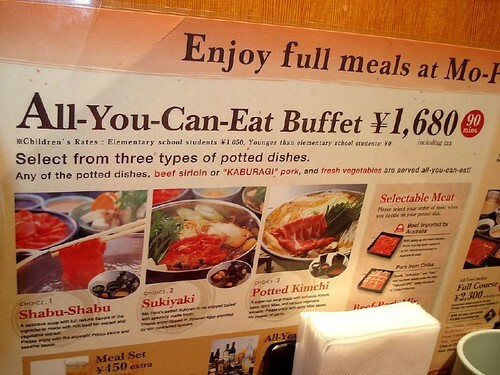 All you can eat choices of shabu-shabu, sukiyaki or kimchi, originally uploaded by Camemberu. Fortunately, the English menus are clear and informative. You have a choice of shabu-shabu broth, sukiyaki or a kimchi pot. If you have a larger group, you can opt for two types. They will serve beef or pork (add a small surcharge if you want both) with vegetables. 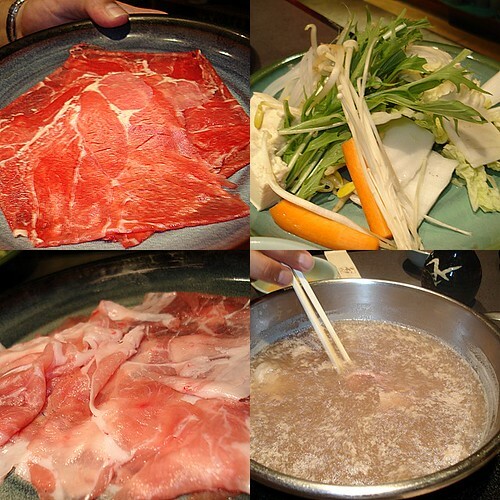 Mo-Mo Paradise shabu-shabu offers unlimited beef, pork and vegetables, originally uploaded by Camemberu. We had beef sirloin and Kaburagi pork sliced extremely thin that cook in a mere matter of seconds. Dip these in either of two sauces - gomadare (sesame) or ponzu (citrusy soy vinegar). You cook the vegetables last of all, after the broth has been flavoured with all the protein sweetness from the meat. Mo-Mo Paradise (or Mo-Para for short) is a chain with nine branches in Tokyo. Again, as with most tabehodai (all-you-can-eat) places, it's immensely popular with students and 20-somethings with large appetites. 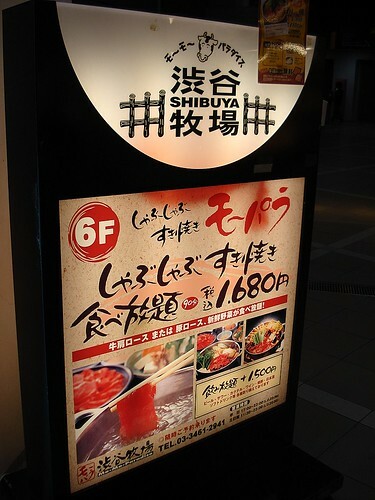 I hear lunch deals are even more affordable at ¥1000 or less! Udagawacho 31-2, Shibuya Beam 6F. eh...hope still in time,u can buy the famous tokyo banana at narita airport. www.tokyobanana.jp a must try! Ah I'm actually back already. Didn't see any Tokyo Banana at the airport though. Must look out for it next time! Hi, your blog is fantastic, still looking at it, so much info I can get here. BTW, I'm temp work in Japan, wish to look for nice food in Tokyo and Osaka, do you have any recommendation? Noted of Mo-Para, will try it next week. Thank you 水瓶鱼 - you can take a look at my other Japan entries - they're mainly of Tokyo and Osaka. There's so much good food in Japan, it's hard to cover them all! Mo-Para is actually more value-for-money than truly gastronomic. Hi me again (from comment of 'Feast@East'. prob should address myself as 'me again for identification, haha). How coincidental. During my last trip to tokyo I had a wonderfully value-for-money lunch at Mo-Mo Para too (also the shibuya branch). It's great and you can never find such quality at such prices in Singapore. Too bad I arrived near closing time and can't have too many rounds of those yummy beef. Hi "me again" (lol you should really settle on a permanent nick or pen name). Glad to know you liked Mo-Mo Para too.